Western Whiskey Gazette (WWG): Good Ol' number "16"
The mystery of mold numbering on the base has us scratching our heads as often as not. Sure, McC and C&I show up on a lot of older whiskies and the source of the bottles is well know. But what about the "lowly" tool tops? haven't seen them -'cause they're rare! About as common as chicken lips, the number "16" variant is seen on a small handful of mid nineties tool top cylinders and "crossovers" with neatly applied tops. The numbers of each are about equal. 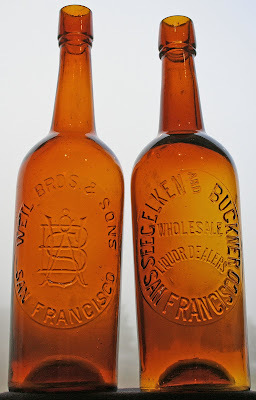 These bottles are comparatively easy to date thanks to McLeod and Faus, who were in business for only two years; 1894 & '95. Other S.F. wholesalers who used this "16" base mold include Weil Bros and Sons (ca. 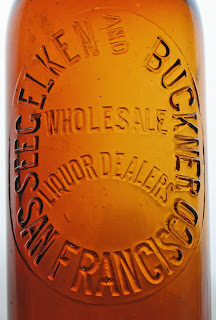 1888 - 1917), Seegelken and Buckner (ca. 1893 - 1899), and Roth and Co. (ca. 1859 - 1919). Seems to me that there might be another, but the name escapes me at the moment. The embossing patterns on all but the Roth (and it may be as well but can't remember that either) are very distinct in that the lettering is contained within a nearly full faced oval, instead of the typical round slug plate. 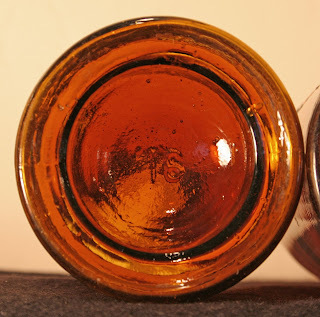 Other consistencies include an abnormally bold strike (probably because the molds were new and very few bottles were blown in them) a distinctive light orange amber coloration and notable overall character. I've heard of a total of five Weil's, a couple of Seegelken and Buckner's and Roth's and one solitary McLeod and Faus. The Weil is a fairly recent discovery and it is not yet listed. have "and" embossed as "&". Embossing styles and fonts are about as varied as one could ever expect to encounter. Top styles are also varied, as is the length that the necks were drawn out. None bear any evidence of mold air venting, although the Seegelken has what appears to be some form of embossing venting in the letters at the very top of the slug. The Weil does not. In my book, this grouping is pretty tough to beat. They've got everything going for them in terms of color and character. Compared to early glop tops with equal rarity, they can be had for a song; that is, if you can find one... And, preferences aside, both the glop top and tooled top versions of Good Ol' number "16" are darned tough to beat for even the most advanced collectors out there in western whiskey land. But the question remains; who were those masked men that made this bunch of bottles? And the plot thickens; I kinda thought I remembered another and sure enough, my old pal Rich L. sent photos of it. Now we're talkin'! A picture toolie with the "16" base. Notice the familiar "and". What a smoker! Oh, and by the way, MOHNS & KALTENBACH (ca. A quick summary is now in order. 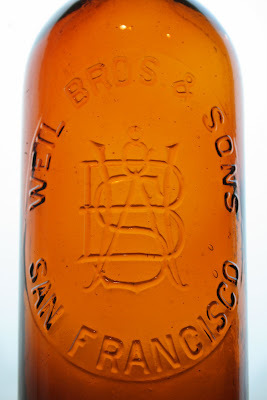 Based on the earliest possible date that the bottles could nave been blown for Mohns & Kalthenbach, and the latest date that they could have been blown for McLeod and Faus, it is evident that the "16" base could have been produced only in 1895. Time frame confirmed. Now who were those masked men?? ?